"The Web is changing, and we at the PBS Newshour are changing with it through experiments like these." - Hari Sreenivasan, PBS Newshour. Mozilla's trajectory toward media, news, and journalism is not new. Recent experiments -- like collaborations with PBS Newshour to add a layer of analysis to the recent State of the Union, or enabling the New York Times Lede blog to embed crowd-sourced translations of an interview with Egyptian protester, Wael Ghonim -- are just the tip of the iceberg. Back in the summer of 2009, Mozilla quietly got to work on Drumbeat as a way to encourage millions of people to act as stewards of the open Web by explaining and protecting the Internet as a critical public asset. Just a short time later, Drumbeat has helped to grow some critical pieces of the puzzle, like Processing.js, Universal Subtitles, and Web Made Movies / Popcorn.js. Universal Subtitles: Launched in 2010, this is an ambitious project to make it possible for almost anyone to subtitle almost any online video -- enabling people to communicate with each other across language barriers. In a short period of time, Universal Subtitles has been adopted by organizations like Wikipedia, the Khan Academy, and -- most recently -- is being found on sites like the New York Times Lede blog. This last example shows the opportunity for news organizations, as the Internet facilitates access to a more global audience, to engage more people in the work of making information broadly available. Web Made Movies / Popcorn.js: Last but far from least, I wanted to highlight the amazing work of Bret and the team working on Web Made Movies. Web Made Movies, is an open video laboratory researching the intersection of video and the Web and Popcorn.js is one of its first products. Popcorn.js enables publishers to add a rich layer of semantic data to online videos. I can imagine the example referenced above -- the PBS coverage of the State of the Union -- extended to large public media archives, or used for near-live events like the ongoing state senate coverage done by upstarts like The Uptake. These three technologies alone have the potential to liberate volumes of online video from a closed-format prison, and -- instead -- to enshrine video as a first-class citizen of the open Web: searchable, semantically rich, and -- thus -- interactive. I share this with you because I want everyone to have a context for the type of state-change that Mozilla is thinking about in the media ecosystem. The examples above are just the beginning: when I had the chance to sit down with Ben Moscowitz last week (Ben's the new Chief of Cat-herding for Drumbeat "media" projects) and he was quick to point out that there is a lot more in the Drumbeat pipeline for media, like Hyper Audio, OpenAttribute and Privacy Icons, not to mention the amazing line-up of no-cost, peer-led, courses for anyone -- including journalists -- at the School of Webcraft. To summarize, Mozilla is hard-core committed to playing in the media space. 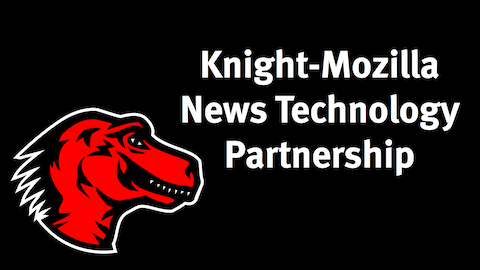 The Knight-Mozilla News Technology Partnership feeds into this commitment, and will push it further than we can imagine today. If you can also imagine a fun, generative, future for Media, Freedom, and the Web, I hope that you'll take a moment to get involved. P.S. Here's a quick example of Universal Subtitles that Ben, Nathan, and I put together last Friday that attempts to explains the "MoJo" project for Mozillians in under four minutes.